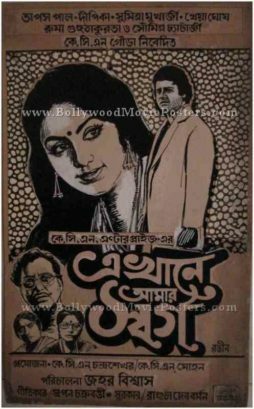 Old Bengali film poster of the classic Indian movie Ekhane Aamar Swarga (1990) for sale. This is an actual surviving old Bengali film poster of the 1990 movie that starred Sumitra Mukhopadhyay, Soumitra Chatterjee, Tapas Pal and Rahul Barman. Printed and circulated a few years after the first release of the film (somewhere in the 1990s), this old Bengali film poster was printed for publicity of the film in Kolkata but never ended up being used. This old Bengali film poster was originally designed in hand painted oil on canvas format by an art studio in Kolkata. The design of this hand drawn old Bengali film poster features quirky portraits of the stars painted using bright colors. The background of this old Bengali film poster is red, giving it a very eye catching appearance. The highlight of Ekhane Aamar Swarga was its music composed by legendary music director R.D. Burman who is duly credited at the bottom of this old Bengali movie poster. Old Bengali movie poster collage of the classic Indian film Ekhane Aamar Swarga (1990) for sale. This is an actual surviving old Bengali movie poster collage of the 1990 movie that starred Sumitra Mukhopadhyay, Soumitra Chatterjee, Tapas Pal and Rahul Barman. Designed and circulated during the first release of the movie (somewhere in the early 1990s), this old Bengali movie poster collage was created for publicity of the movie in Kolkata but never ended up being used. This old Bengali movie poster collage has been created by pasting still photographs on a board and over painting them – i.e. it is not a print but an actual over painted board! The painting over the still photos is done in bright white color highlights and accentuates the design. Created by an art studio in Kolkata at the time of the film’s release, this old Bengali movie poster collage features a beautiful arrangement of black and white photographic stills that have been cut and arranged over a hardboard and then overpainted using a paintbrush. The highlight of Ekhane Aamar Swarga was its music composed by legendary music director R.D. Burman who is duly credited at the bottom of this old Bengali film poster collage. Old Bengali film poster collage of the classic Indian film Ekhane Aamar Swarga (1990) for sale. This is an actual surviving old Bengali film poster collage of the 1990 film that starred Sumitra Mukhopadhyay, Soumitra Chatterjee, Tapas Pal and Rahul Barman. Designed and circulated during the first release of the film (somewhere in the early 1990s), this old Bengali film poster collage was created for publicity of the film in Kolkata but never ended up being used. This old Bengali film poster collage has been created by pasting still photographs on a board and over painting them – i.e. it is not a print but an actual over painted board! The painting over the still photos is done in bright white color highlights and accentuates the design. Created by an art studio in Kolkata at the time of the film’s release, this old Bengali film poster collage features a beautiful arrangement of black and white photographic stills that have been cut and arranged over a hardboard and then overpainted using a paintbrush. Old Bengali movie poster of the classic Indian film Ekhane Aamar Swarga (1990) for sale. This is an actual surviving old Bengali film poster of the 1990 film that starred Sumitra Mukhopadhyay, Soumitra Chatterjee, Tapas Pal and Rahul Barman. Printed and circulated a few years after the first release of the film (somewhere in the 1990s), this old Bengali movie poster was printed for publicity of the film in Kolkata but never ended up being used. This old Bengali film poster was originally designed in hand painted oil on canvas format by an art studio in Kolkata. The design of this hand drawn old Bengali movie poster features striking portraits of the lead actors in stunning radiant colors. The background of this old Bengali film poster is black, giving it a very eye catching appearance.